With your experiments in place, it’s time to start testing them and tracking the progress over time. Sometimes your tests will return positive, sometimes negative. Along the way you’ll learn and iterate – adding and changing as you go. This tool, developed by Ash Maurya, will help track your progress over time. Running one experiment is almost never enough to know you’re right. Some startups make many pivots before they find the right product-market fit. In every case, it’s absolutely essential that you know where you’ve been before moving on. It would be a waste of time and resources to continue to run the same exact experiment over and over again, waiting for the results to magically change. Looking back will help you understand the choices you have already made and avoid the resurfacing of invalidated assumptions later in the process. The goal of the validation process is to learn as much as possible, as fast as possible. You’ll want to spend as little time and effort as you can in this process, while we maximize the outcome. With that in mind you’ll need to run experiments iteratively. The validation board is the central nervous system of this process. It starts with the Value Proposition you have at this moment. This is your current “best guess” with respect to who your customer is, what problem you solve for them, and what your solution is for that problem. No need to make this overly complicated. Start small, with the simplest solution you can test. Over time, pivots will change that best guess. Your current best guess is based on assumptions. Find the riskiest one: the one that, if it’s wrong, completely disproves your best guess. Choose a way to test that assumption and define what the minimum criteria for success are. Plug this stuff into the experiment report and run the experiment. When it comes to experimentation methods (i.e. prototypes) you can choose from things like exploration, pitching, or even a concierge model. Through exploration, you’ll learn more about the problem you’re trying to solve for. Pitching will help you understand how important your customer thinks the problem is. Is it a must have or a nice to have? A concierge model will help you understand whether you can deliver on the customer’s expectation at first, doing it by hand etc. The key to using a tool, like the Validation Canvas, is that you become super scientific and diligent about how you test, learn from, and share your results (with your team). The more you do this, the easier it gets. 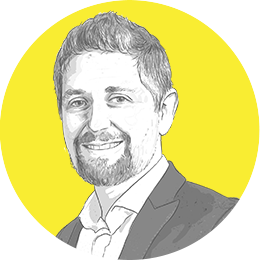 Plus, once you’ve made your first couple of pivots and/or learned something really interesting about your customer – and you’ve captured those on the Validation Canvas – you’ll want to do it again. Above you can see the Validation Canvas for SpaceX. 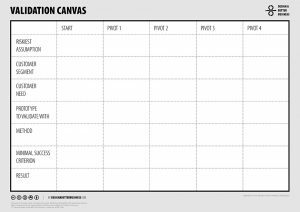 Before this blog we posted a blog about the Riskiest Assumption Canvas and the Experiment Canvas, and this Validation Canvas is this canvas is a result of those two canvases. As you can see, we start with the riskiest assumption: ‘Business people will use rockets instead of airplanes to fly to their destination.’ The customer segment include business people who travel often, and cover long distances. Their custom need is to save time by travel really fast. After formulating the hypothesis, describe what your experiment will look like, and what the desired result is. In this case, we will make a video to invite business people to buy a ticket and experience a rocket flight. The minimum success criterion is that we sell 50 tickets. 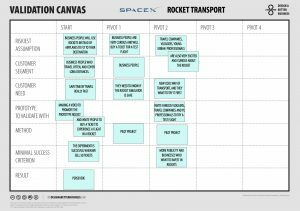 In this example you see the first pivot with the riskiest assumption: Business people are very curious and will buy a ticket for a test flight with the rocket. But they need to know that the rocket simulator is safe. Another pivot is that travel companies, vloggers, and young urban professionals are also very excited and curious about the rocket, and that they want to try it first. The minimal success criterion can be that SpaceX wants more publicity and more investors. Using the Validation Canvas will help track your progress over time. Running an experiment takes time and effort. Before going out and doing a large-scale experiment, try it out first on a small scale to iron out any issues with the test itself. The goal of the validation process is to learn as much as possible, as fast as possible. You’ll want to spend as little time and effort as you can in this process, while we maximize the outcome. Interested in running and tracking your own experiments? We can help you. Feel free to reach out anytime.